Kinn Bryggeri takes its name from the small island of Kinn, where Espen and his wife Ann-Magritt were married in 2005. The island’s distinctive mountain, Kinnaklova, has been used by mariners as a navigation point for centuries. ”Brewing the old-fashioned way,” exclaims the front page of Kinn Bryggeri’s website, alongside an illustration of a Nordic-looking gentlemen in distinctly old-fashioned skis. This isn’t just a marketing gimmick though - from day one, founder Espen Lothe has been fascinated with tricky traditional brewing techniques, from open fermentation and wild yeast to barrel-ageing, and his growing success suggests he has struck a chord. Starting out, as so many do, as a teenage homebrewer, Espen spent the early 2000s immersed in Norway’s thriving homebrew scene, learning his trade among such Nowegian craft pioneers as Kjetil Jikiun and Jens Maudal, who would later go on to found Nogne o. He recalls that the passion of this community felt like a direct reaction to the sorry state of Norway’s commercial beer industry at the time. ”What you have to understand is that Norway was not like the UK. We didn’t have that group of small, traditional breweries keeping the old styles and skills alive alongside the macro lager brands. For us, everything had been bought up and destroyed by the big boys decades earlier, so the only notion we had of craft came from what we could create in our kitchens. ”The joy of making something was my motivation,” he says. “From using juniper extract in the mash, gradually my knowledge grew and the quality of the ingredients improved.” This is something of an understatement, as Espen began competing for and winning awards from Norbygg, the Norwegian Association of Home-brewers, and was named Home Brewer of the Year two years in a row. It wasn’t until the beginning of 2007 though, when Espen was recuperating from a broken leg, that he reached the momentous decision to leave teaching and open his own brewery. In addition to his old homebrew buddies at Nogne o, Espen had forged relationships with other successful Norwegian craft brewers, including Haandbryggeriet, Aegir, Baatbryggeriet, Lillehammer Bryggeri and Sma Vesen. This gave him access not only to advice, but also to second-hand equipment: a malt mill from Haandbryggeriet, boiling vats and vortex unit from Sma Vesen, and mash vats, hot water tank, storage tanks and open fermentation vats from Tine Dairy. For much of the two years it took him to assemble everything he needed, this growing pile of kit sat forlornly in Espen’s back garden. Through a combination of seed funding from Innovation Norway, support from his family and even renovation loans on his home, Espen finally opened the doors of Kinn Bryggeri AS in April 2009. In the early days, Espen was on his own, brewing, tapping, washing, sales, deliveries, and more. By the end of its first year, Kinn was producing around 700 litres each week, in eleven different varieties; just enough volume to keep the wolf from the door. But the seeds of success had been planted. With Espen’s brother-in-law lending a vital second pair of hands on the production side, Kinn began to gain a foothold among respected bars and stores in major towns, going from a local start-up to a more widely recognised brand. Things really shifted up a gear in early 2011, when Kinn began selling to the Norwegian Wine Monopoly, Vinmonopolet. This was such a significant contract - and sales went so unexpectedly well - that Espen suddenly found himself under pressure to increase capacity. ”We bought a semi-automatic bottle filler and labelling unit, which was a huge relief from the hand-labelling process we’d used up to that point. We also brought on new employees and started planning for a new site, which we finally moved into in the summer of 2013, increasing our capacity from 800 to 3500 litres.” But what of the beer itself, and Espen’s self-imposed injunction to do things ‘the old fashioned way’? The approach that would eventually become Kinn’s signature was borne out of both Espen’s own tastes - he has deep respect for the Belgian brewing tradition - and the commercial need to stand out in a highly competitive market. ”By the time I started, the quality of Norwegian craft beers was already excellent,” he recalls. “So to make an impression I knew I had to be just as brilliant as Nogne o and Haandbryggeriet,” recalls Espen. ”I didn’t want to create a miniature version of an industrial brewery, where you press a button and never see the product until it reaches the glass,” he says. “Open, oxygen-rich fermentation vats were the only true way for me. ”Open tanks bring a mix of advantages and drawbacks. Almost as distinctive as the beers themselves, Kinn’s branding is beautifully simple, drawing on local history to create something that looks and feels unmistakably Norwegian. ”I got to know a local graphic artist, Oda Valle, quite early in the brewery’s planning. She was just starting out at that time, and I believe we were her first clients. We hit it off and started to work on our branding. 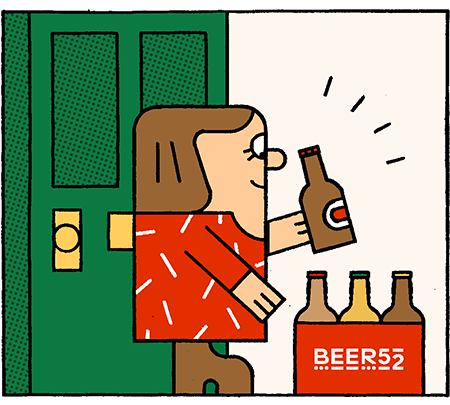 My idea was that the beer drinker should have an enjoyable experience all the way from first catching sight of the bottle on the shelf, to consigning it to the bottle bank for recycling. ”I wanted a dependable, traditional figure on the label, and after some discussion it was decided to use the ‘Father of New Norwegian’, Ivar Aasen. Of course, Oda has developed his portrait in her own inimitable way, but it really is him we are honouring. Since then, beer-blogger Hugo Ivan Hatland has pointed out that the figure resembles the former parson of Kinn, a happy coincidence perhaps.” Today Kinn is thriving, with 14 employees, a strong brand and - thanks to Anne-Magritt’s work in developing its international channels - distribution in Denmark, Sweden, Finland, UK, Russia, Germany, Belgium and Spain. Just as satisfying for Espen, the brewery has earned a reputation for nurturing new talent, just as he himself was once helped up. One side-effect of Kinn’s rise has been to take Espen away from the day-to-day brewing. This is an ironic challenge familiar to many passionate, hobbyist brewers, whose skill leads to commercial success. However, Espen has refused to take this lying down and last summer returned to his old brewery in Strandgata, to take the helm of a pilot brewkit, featuring open fermentation vats for 25, 400 and 800 litre batches. With special vessels for bacteria and wild yeast, separate from the normal brewery lines, as well as a dedicated, temperature-controlled oak cask storeroom and a cool cellar below ground, this is a playground specifically designed for Espen; a workshop for developing new recipes, ideas, and new methods.